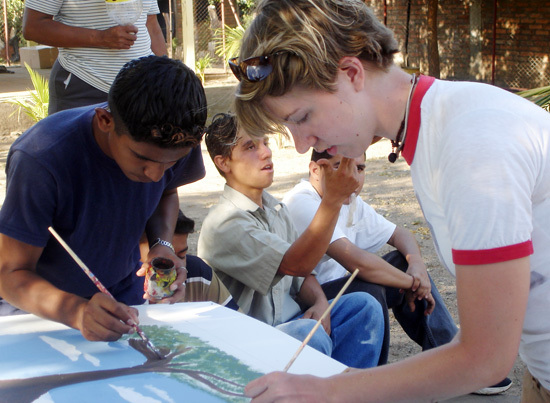 At right, Jessica French Smith ’09, paints a mural with students from Nagarote, Nicaragua. French Smith received a Projects for Peace grant, which will allow her and fellow Wesleyan students to return to the city this summer to build a community center. 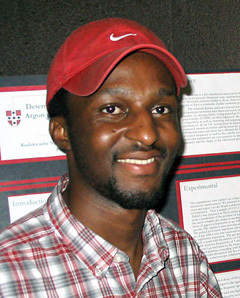 After exams finish up, Kudakwashe Ngogodo ’08 hopes to provide safe drinking water in a rural community in Zimbabwe. Jessica French Smith ‘09 wants to spend her summer building a community center for the troubled youth of Nagarote, Nicaragua.With support from the Kathryn Wasserman Davis 100 Projects for Peace Program, Smith, Ngogodo and other students from 65 colleges and universities will receive funding to undertake their proposed projects. Philanthropist Kathryn Wasserman Davis, on the occasion of her 100th birthday in February, established the new program with a donation of one million dollars so that each of the projects will receive $10,000. The objective of the program is to encourage and support motivated youth to create and implement their ideas for building peace throughout the world in the 21st century. Economics and math major Ngogodo, pictured at left, hopes to engage the community in a peace-building project titled Hope  Water Project. The project will entail sinking at least two boreholes, which will serve the community with clean and safe water. He hopes that creating this clean-water resource will mean people in the community will no longer die from ingesting parasites and bacteria that exist in dirty water. French Smith, who is coordinating the project Nagarote-Wesleyan Partnership, will use the fellowship to travel to Nagarote, Nicaragua with fellow group members Sean Corlett ’07, Lorena Estrella 10 and Nelson Norsworthy ’10. This small community faces many hurdles to combat poverty including inadequate access to health care, low literacy and graduation rates, high crime rates, high drug usage and low wages in sweatshop-like environments. The Wesleyan students have already partnered with youth and community members to begin the project in June. Funds have already been raised to purchase land and a building; however the facility requires major renovations to function as an adequate classroom and gathering space. The projects were judged and accepted by the Davis United World Scholars Program office. Applications included a written statement of the project including expected outcomes, prospects for future impact, and a budget proposal. The Hope  Water Project and Nagarote-Wesleyan Partnership will be completed this summer. There is a future to consider not only for ourselves, but also for those who come after us, Ngogodo says.